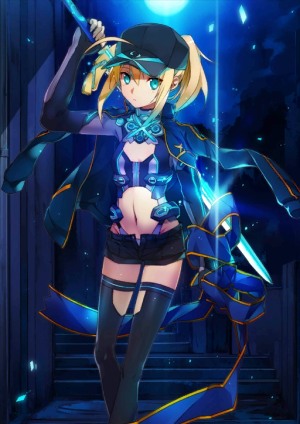 This page is for the 5★ Mysterious Heroine X. For the 5★ , please refer to Mysterious Heroine X (Alter). Available during the Saber Wars event. Increase your Critical Star Drop Rate by 10%. Deal signicant damage to one enemy. Overcharge: Deals extra damage against Altria Face enemies. 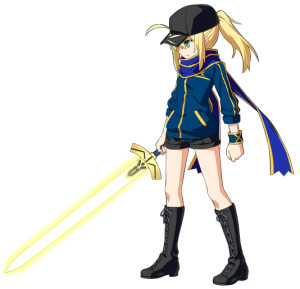 When equipped on Mysterious Heroine X, all allies will inflict 20% bonus damage against [Saber] while on the field. That's where the stranger claims she's from. 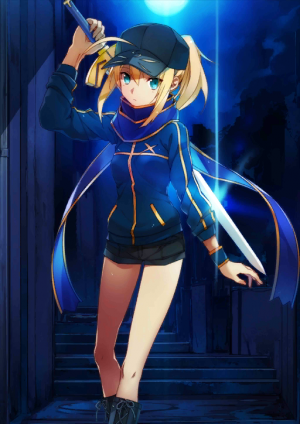 She calls herself "Saber: the Definitive Edition." 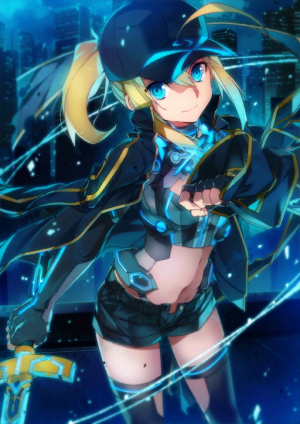 Through a combination of fair duels and assassinations, she's the ultimate Anti-Saber weapon. 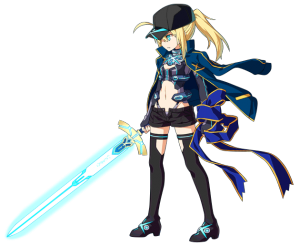 I will kill everyone using my sword, the "Secret Calibur." "Altria-Types are like a cancer on the world, someone must eradicate them, someone must..."
With determination in her heart, Heroine X left her home and rides the Du Stallion II through the starry ocean. Her look is too rough and sporty for a typical Servant. Her scarf is a symbol of courage, and her hat conceals her face and her ahoge. But it's still poking out, oh it's definitely poking out. 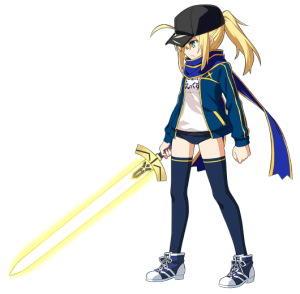 As the Anti-Saber weapon, my only purpose is to defeat Sabers with my sword and my will. But, I opened up my heart to Saber Lily. Until she came here, she was saving an ancient dynasty, solving the internal quarrels of the Human Alliance Union, and dispersing intruders from other universes. However, she doesn't remember any of this because to her, such deeds are ordinary. 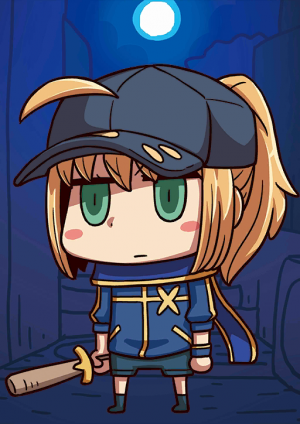 She will also cut down the Golden Emperor, Gilgamesh, as many times as she needs to. Don't tell anybody, but her true identity is Altria Pendragon. She thought her perfect disguise had tricked everyone. Please don't say anything about who she really is, for the sake of spoilers and her honor. Claiming to be the definitive version of the Saber class, an Anti-Saber Decisive Weapon that performs fair-and-square surprise attacks as a knight. A stranger visiting from a mysterious dimension called Servant Universe. She uses the mysterious magical sword "Himitsucalibur" to exterminate all of her enemies. The Artorian race is like cancer to the universe. Someone has to exterminate all of them. Someone has to. Saying so with a bitter expression on her face, Heroine X left her hometown. Even today, her beloved machine Du Stallion II races through the sea of stars. 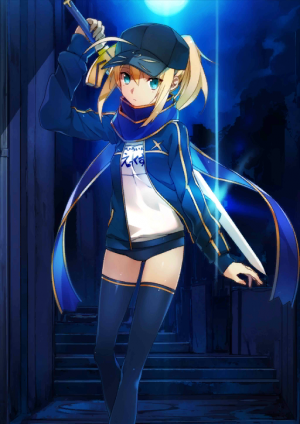 Unlike most servants, she wears an informal and sporty outfit. The blue scarf is a symbol of courage, while the hat serves to conceal both her identity and her cowlick. It sticks out-it sticks out-it really sticks out. As an Anti-Saber Decisive Weapon, she normally goes into a carnage mode wielding her single holy sword for the sole purpose of defeating all present Sabers, but she has opened her heart towards Saber Lily alone. Before coming here, she saved an ancient royal dynasty from a crisis, settled the internal strife of the Mankind Integration Union, and routed invaders from another universe, but, for her, that was akin to a snack before breakfast. Since it was so trivial, it seems as though she does not remember. Until she achieves her truest, dearest wish, she shall continue to wield the Himitsucalibur. Also, no matter what, she will simply cut down the Golden Great Emperor Cosmo Gilgamesh. She has not revealed this to anyone, but her true identity is that of Altria Pendragon. 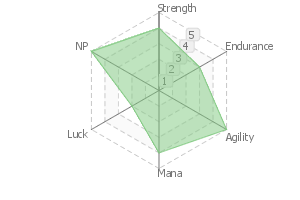 She shares the exact HP values (at both minimum and maximum) with Jack the Ripper. NP Rank (Pre-NP Interlude) changed from A++ to A+ during the 9 August 2017 update (JP Server).